Huh. Well, didn’t see this one coming! Overwatch has revealed its 28th Hero, and he’s a chubby-cheeked hamster named Hammond who enters battle in a heavily-armed mech ball. Are the makers of Overwatch getting their kids to design new Heroes, Axe Cop style? If so, I’m on board — bring on the wackiness! Check out an origin story trailer for Hammond, who goes by the codename Wrecking Ball, below. Wrecking Ball can confidently start fights at any time by rolling into the enemy team and popping Adaptive Shield, which makes him incrementally more difficult to eliminate for each enemy nearby. If a fight is no longer going in his favor, Wrecking Ball can easily escape from the fray by using Grappling Claw to quickly swing back to the safety of his team. Minefield can prevent enemies from reaching a preferred location or can be dropped on top of them to cause an explosive burst of damage on all foes in a single location. 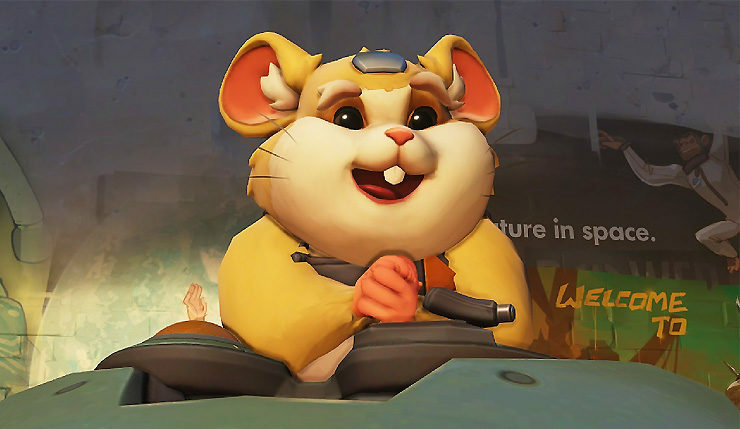 It feels like Overwatch has crossed a major creative line with Hammond – previously, Jeff Kaplan let it slip that Blizzard had toyed with a Jetpack Cat character, but shelved the idea because it went “too far.” You could argue this latest character delves even deeper into silly waters, so who knows what we might get next? [Reaches into the Mad Libs grab bag] uh, a dolphin with robo stilts? A tortoise with a hover board? A horse that drives a car? Feel free to contact me for even more of great ideas, Blizzard. You can test out Wrecking Ball right now the Overwatch Public Test Region. The character should be available for everyone within the next couple weeks.